The U.S. road racing season started off with two excitingly tight finishes at Daytona International Speedway yesterday, as the Superstock and Supersport classes faced off. Aaron Yates took the win in Superstock for the Michael Jordan team, while Ben Bostrom squeaked out the narrowest of victories (0.012 second, or about a wheel-width) over his teenage parter (and no doubt future superstar) Josh Herrin. 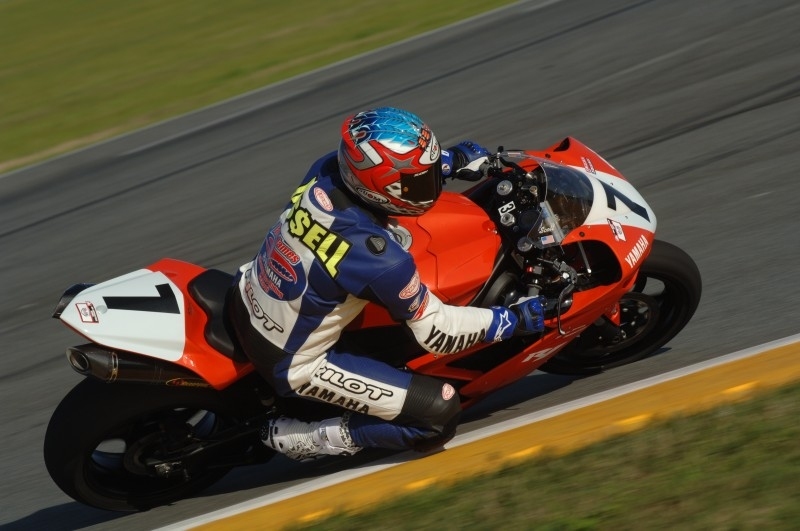 In Superstock (relatively lightly-modified big bikes, very similar to Canadian "superbike" specs), of the 29 entries no fewer than 26 were Suzuki GSX-R1000s, with two Yamaha R-1s (Johnny Rock Page and five-time 200 winner "Mr. Daytona" Scott Ru$$ell) and one Honda CBR1000RR (Jake Holden). Russell’s return was greeted with enthusiasm, but he ran off the track twice and the bike slowed, and he retired after eight laps. Before the race he’d said that he felt good, thought he was riding well, and was looking forward to the contest. Commentator and multi-time world champion Freddie Spencer was a little more circumspect, saying that while Russell no doubt was a great rider, "Scott’s riding as hard as he knew how to when he had to stop in 2001, and the kids are riding as hard as they know how to today." Bit harsh, maybe, but it looked 100% dead-on in the race. The event wasn’t the most exciting ever at the Speedway, although the contest for the first three spots between Yates, his team-mate Geoff May, and M4 Emgo Suzuki’s Blake Young was good, and a bit farther back, Chris Ulrich, Chris Peris (of Calgary), and veteran Michael Barnes had a good battle, finishing in that order; a good result for Peris who has high hopes for this season. Up front, Young surprised everyone by rocketing into the lead and holding it until mid-distance, after which both May and Yates got past, and the three scrambled for position after that with Yates eking out a slight lead and May not quite able to get by Young. Directly after Superstock came Supersport, modified 600 cc street bikes much the same as the 600 classes in Canada. Like the Superstock race, this spread out a little more quickly than is usual, albeit with lots of good racing in clumps through the field. Up front, veteran Ben Bostrom and youngster Josh Herrin on the Graves Yamaha R6s never really looked challenged despite having to hold off Blake Young until late in the race. At that point Roger Lee Hayden, the youngest of the three Hayden boys, dragged his Kawasaki ZX-6R up to their tail by the scruff of its neck despite riding with a cracked bone, ripped tendon, and swollen elbow suffered in practice earlier that day. Ben Bostrom: "Win every race"
draft with no time to catch back up. touched Bostrom (at about 275 km/h) as he jinked just before the line. Bostrom later said, "It really reminded me of the Harley days (Bostrom made his name in a spec Harley Sportster series years ago) … I haven’t done that since the Harley. I used to go right against the wall and come down, and actually just ride the apron to the finish. I was going to try that on the 600, and thought I might highside my brains out there. It’s a bit dirty down there. So I ended up just going straight back, in a line like that. I didn’t know where Josh was. I was thinking, ‘Man, if Josh is coming around high like that, we’re going to collide.’ I wasn’t sure what was going to happen. It worked out. I didn’t think I was going to win, honestly. I thought Josh had me snookered." "Josh is a great team-mate — he won’t get suckered like that again!" Before the race Bostrom said, dead-serious, "My aim is to win every race this year. Every single one. And to lose a couple of fives (his race number is 155)." The other rider who had a run at the front was Josh Hayes, the 2007 F-Extreme champion and second-finisher in Supersport. His Erion Honda was right there until the muffler on his exhaust came loose and he had to pit to have it removed, eventually finishing a frustrated 17th.